Q: According to reports, two US B-1B bombers flew over waters east of the Korean Peninsula yesterday. What is China's comment on that? A: We have noted the relevant reports. The current situation on the Korean Peninsula remains highly complex and delicate. We hope all the relevant parties can remain restrained and avoid taking actions to provoke each other and aggravate antagonism and tension. Q: Yesterday, a US destroyer entered the territorial waters off China's Xisha Islands under the pretext of "freedom of navigation". What's your comment on that? A: On October 10, the missile destroyer USS Chafee entered China's territorial sea off the Xisha Islands to carry out a so-called "freedom of navigation" operation without China's approval. The Chinese side immediately sent naval ships and fighter planes to identify and verify the US warship according to law and warn and expel it. The Xisha Islands are an inherent part of the Chinese territory. In accordance with the Law of the People's Republic of China on the Territorial Sea and the Contiguous Zone, the Chinese government promulgated the baseline of the territorial sea off the Xisha Islands in May, 1996. The relevant behavior of the US warship has violated the Chinese law and relevant international law, severely undermined China's sovereignty and security interests, put in jeopardy the life safety of the frontline personnel from both sides. China is firmly opposed to this and has lodged serious representation with the US side. The Chinese government will continue to take firm measures to safeguard China's territorial sovereignty and maritime rights and interests. 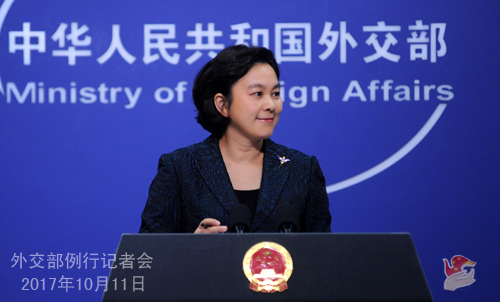 We urge the US side to faithfully respect China's sovereignty and security interests as well as regional countries' effort to uphold peace and stability in the South China Sea and stop such wrongdoings. Q: China and Russia held the consultation on Northeast Asia security in Moscow yesterday. Can you give us more details about what has been discussed? A: On October 10, the 8th China-Russia consultation on Northeast Asia security was held in Moscow. Chinese Assistant Foreign Minister Kong Xuanyou and Russian Deputy Foreign Minister Igor Morgulov co-chaired the consultation. Officials from the foreign, defense, security and other departments of both countries were present. The two sides express high concern to the current situation on the Korean Peninsula. Both of them believe that all the relevant parties should remain restrained, refrain from actions that may escalate tensions and faithfully uphold peace and stability of the Korean Peninsula and the region. The two sides reaffirm their adherence to the goal of the denuclearization of the Peninsula, call on various parties to positively respond to the Chinese-Russian joint initiative based on the "suspension for suspension" and "dual track" proposal and the "step by step" roadmap, and urge all parties to return to the track of dialogue and negotiation at an early date. Moreover, the two sides reiterate the opposition to the deployment of the Terminal High Altitude Area Defense missile defense system in the Republic of Korea (ROK) by the US and the ROK. They also agreed to continue with close communication and coordination in an effort to jointly respond to the regional situation. Q: Yesterday the president of Spain's autonomous region of Catalonia offered a dialogue with the Spanish government before implementing the Declaration of Independence. Given China's investment in Catalonia and the fact that Spain is an important partner of China in the Belt and Road Initiative, is this political crisis a matter of concern for China? A: We have noted the relevant situation in Catalonia of Spain. China has said multiple times that this is Spain's internal affairs. We believe the Spanish government and people can properly handle the issue and uphold national unity and prosperity. Spain is a friendly country of China, and we will continue to develop friendly cooperation with it by upholding the principle of respecting each other's sovereignty and territorial integrity and non-interference in each other's internal affairs. Regarding your question of whether the Chinese side is concerned that this will affect the trade and investment between China and Spain in the future, I don't think we need to worry about it. As I said just now, we believe the Spanish government and people can properly handle the relevant issue and uphold national unity, stability and prosperity. As a friendly nation of Spain, China is willing to keep upholding the principle of mutual respect and reciprocity to develop mutually beneficial cooperation with Spain in various fields, including the fields of trade, investment and finance. Q: Yesterday, a ROK lawmaker said the DPRK hackers have invaded the computer system of the ROK defense ministry and stolen large amounts of confidential documents including the combat plans of the US and the ROK. Is China aware of the relevant information and do you have any comment on that? A: I have seen the relevant reports and I'm not aware of the relevant situation. Like what I said when answering the first question raised by Yonhap News Agency, the current situation on the Korean Peninsula remains highly complex and dedicate. We hope all the relevant parties can do more things that are conducive to establishing mutual trust and deescalating the tension. Q: As to the issue of the Rohingya people in the Rakhine State of Myanmar, there is still a large exodus going on in Myanmar. This crisis has put some pressure on the government of Western countries and force them to take action to address the humanitarian crisis. 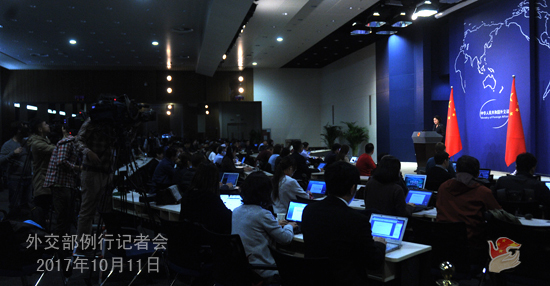 Whether China's position has changed over the prolonged and escalating situation? Whether China will support any measures on Myanmar including backing UN resolutions or other multilateral proposals for sanctions? 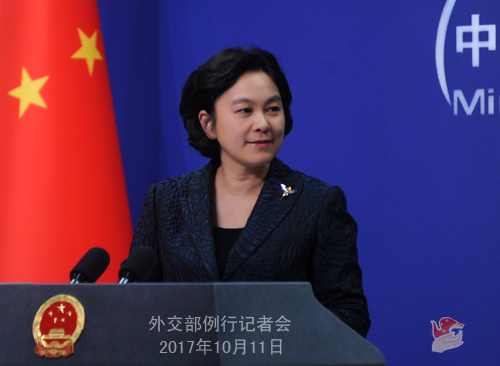 A: As to the situation in the Rakhine State of Myanmar, China has stated its stance at request multiple times. We hope the relevant issue can be properly handled through dialogue and negotiation as early as possible, and the conflict be subsided and the innocent spared from harm. The Chinese side has noted the series of measures of the Myanmar government to ease the situation and uphold the stability of the Rakhine State. The Chinese side supports Myanmar's effort to uphold peace and stability in the Rakhine State and we hope Myanmar can maintain social stability, ethnic solidarity and economic development. We also call upon the international community to view the situation in the Rakhine State in an objective manner, because the relevant issue is rather sensitive and complex, and involves complex historical, ethnic and religious factors. We encourage Myanmar and Bangladesh to seek a fundamental way out through friendly negotiation. The decisions or measures of the United Nations and other relevant institutions shall also be conducive to the settlement of the issue.